Looking up to Life – The Adventure! I’m just back from my Bhutan trip. My Bhutan trip was a spiritual, adventurous & psychological ride. The trip was a teacher to me. It taught me how religion, faith & belief systems can make people better. It taught me how the best words are silence. It taught me to stretch my limitation once in a while. It taught me to lose my inhibitions & just do it. But the most important thing the trip taught me was that – the world is our home! While I was travelling in Bhutan, one thing that really interested me was talking to people- total strangers. Each person had a story. All they need was somebody to listen to it. I met a lot of wonderful human beings. First in the form of Mr. Pinto who helped us through our travel in Sikkim, as a parent would take care of his children. He was building an airport for Sikkim and running the hotel at the same time. Another wonderful person we met was Mr.Dawa. He was our driver from Sikkim to NJP. An ex-Indian Army soldier, he has spend a good amount of his service period in Siachen. That is the highest battleground in the world. The temperatures there are scary cold and the war was in full swing. He told us how he fell in love with a Delhi girl and got married. He told us how his life changed from being a Gurkha Movement rebel in his childhood to a disciplined young man in the Indian Army. He told us the fascinating story how the Indian army found him too small & little to join, but took him into the army school seeing his football skills. He was telling us how the current generation ignores their body and don’t keep fit. He prompted us to focus on our body, as it is the only thing that is going to be with us till the end. He is currently 45+. Look at his photo!! The next amazing person we met was Mr.Sonam, while we were travelling from Phuentsholling to Thimphu in a bus. We chatted with this lively Businessman, who works in the construction business of Bhutan. He helped us in the rainy night to reach our hotel. He had stories of Bhutan government, regulations, business & his two little girls. I send them a box of mathi (an Indian savoury snack) I had bought from Delhi. Then we met Mr. Tenzing, our Driver- who left his government job in Immigration Dept to drive taxi. He said they pay real less in the government jobs. He told us a lot about the rules, land value & even the life in Bhutan. He told us about the wonderful monarchy that still prevails in Bhutan. The King who made a rule that the council can overpower the Monarch for the betterment of the people. Such confidence in the future generations & far-sighted thought is marvelous! Wonderful people kept coming to me. This time it was Mr.Sonam (A driver) in Paro. His love for Bollywood movies was amazing. He knew a lot about India yet never traveled beyond Bhutan. He told us about their local film Industry. He told us how life in Paro was. He explained to us that people in Bhutan marry very young and they are happy always. 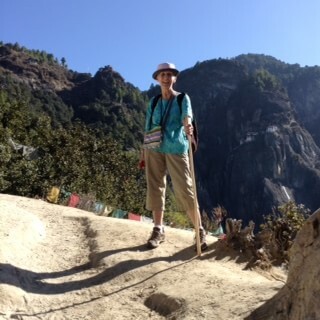 She was trekking along with us to the Tigers Nest Monastery. Our names sounded similar and we started talking. We talked about life in Canada (where she is from) and Kerala (my hometown). She told us about the countries she has been to. It ranges from Namibia to North Korea!! She inspired us to travel. She told us how to keep focused in life. she told us how she gets back after each trip and prints a photo book about the trip. Her grandchildren love them. She is an amazing woman. She had thought of doing half the trek and returning. I inspired her to do the full trek with me! We did not carry our phones, so we wrote our mail ID on the walking sticks with pencil (Just like summer camp kids). We mail almost daily and she tells me all about her life and her lil dog Pixel. I want to show you guys what she has written in Quora about living up to being 100. Click here to read it. So many people to take Inspiration from. so many stories to think of. Life is a wonderful thing. It is too pretty to be wasting in one place my friends!! Go out and explore. It’s not like you are going to get another chance at it. I hope to keep travelling year after year. To see the world- our home! To appreciate cultures, lives, beliefs and people. To know more stories from more wonderful people.